i have just recently managed to find chickpea and buckwheat flour..that is, the supermarkets finally started to stock them. i've made some chickpea flour frittatas (yum!) but if anyone has a buckwheat flour pancake/crepe recipe, i'd be thrilled!! Aaaaaaaaaaaaaaaaaaaaaaw I want sweet pancakes! I've discovered a great recipe for Lebanese parsley pancakes recently tho and have fallen madly in love with them. care to share the parsley pancake recipe? also, if anyone has a decent buckwheat pancake recipe, pleeease post! Mix all together to make a smooth batter, cover and leave to stand for 45 minutes. Makes 4 (7") crepes. I usually have these with grilled veggies, steamed asparagus, or put a bit of chilli or ratatouille inside and roll them up. Great with a tomato/miso/tahini sauce. thanx fiamma!! that sounds great! You're welcome I love these pancakes, they make a nice change and they're so easy to make. these are the cheapest-to-make fluffy pancakes that i know (no soymilk or tofu or applesauce or bananas or flax required). and they taste yummy. mix dry and wet until barely mixed. then add bananas or chopped walnuts, almonds, cashews, pecans, berries, chocolate chips, other fruit, bla bla bla. dont overmix. you want to see those little bubbles form in the batter. the baking soda:baking powder ratio causes them to fluff up. i got this recipe (and modified it a little) from 'Vegan Nutrition: pure and simple' by Dr. Michael Klapper M.D. that book rocks too. 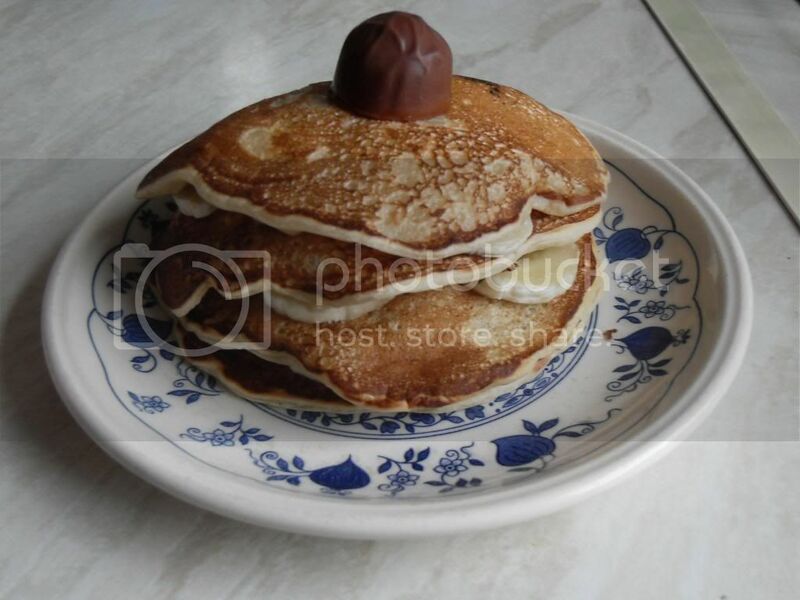 Pancake Tuesday (shrove Tuesday) is nearly here! Will anybody else be making pancakes? I'm even thinking of investing in maple syrup (at nearly &euro;7 a bottle it is an investment!). Not really, no. I find the best way to stop them sticking is to let the batter rest and to heat the pan on low/medium for about 10 minutes before cooking. I have all kinds of vegan pancake recipes...regular banana and gluten free banana rice flour pancakes; buckwheat as well as gluten free buckwheat pancakes; pumpkin pancakes; coconut pancakes; cornmeal blueberry pancakes; orange spice pancakes; sweet potato pancakes; rice pancakes (with actual cooked rice); plain pancakes. I love to warm some frozen berries with a little water on the stove and pour them over the pancakes. Sounds like you're a pancake connaisseur! Which is your favourite? Surprisingly the buckwheat ones are probably my favorite, as they have a robust flavor and absorb fruit and maple syrup well and they are quite filling and satisfying. I've never used buckwheat flour, I should broaden my flour-horizons!